Oh to live in England in the spring. Today marks the beginning of National Stationery Week in the UK. I don’t think we have the equivalent in Canada and we should! Cult Pens are giving something away every day this week. Their prizes include Sheaffer VFM Ballpoint pens, Faber-Castell Grip 2011 Ballpoint pens, and a nifty Zebra Goody Bag with a squishy zebra! You can enter each day here. And it’s open internationally. The Pen Company is celebrating National Stationery Week in three different ways. They have the same Sheaffer and Faber-Castell pens as Cult Pens and they are giving them away each day, difference being you can enter all seven draws all at once here. They are also offering 10% off all purchases for the week. And on April 7 they are giving away a Red Lamy Safari, a Lamy Swift rollerball and a Steel Lamy Econ ballpoint. You can enter that contest here. These giveaways are also open internationally. 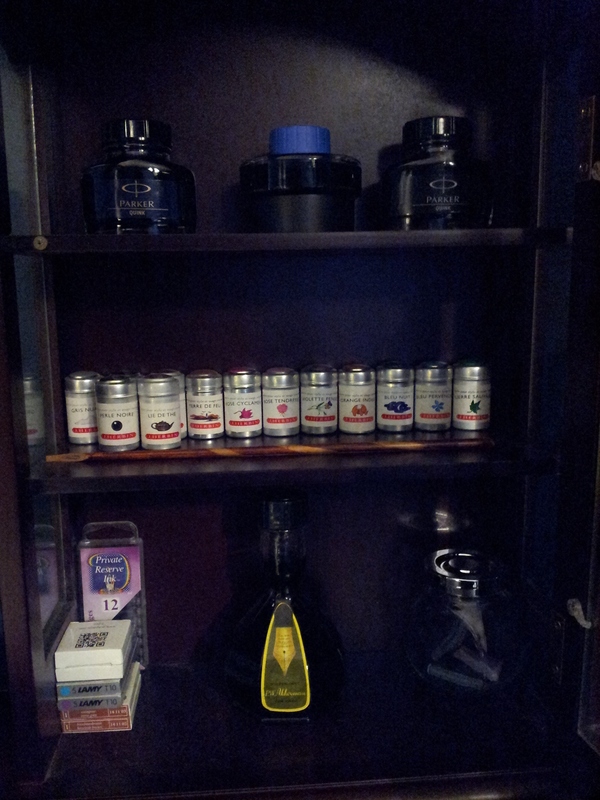 MonteVerde Prima and More Ink! 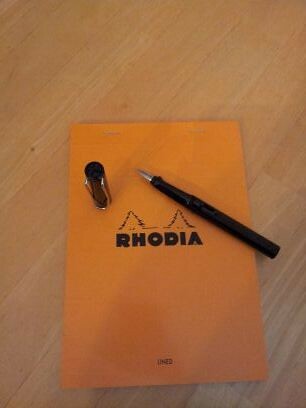 I received a gift certificate for my favorite local stationers, Reid’s Stationers. I had a wonderful two hours looking at everything, weighing my options. The staff is outstanding; Maureen inked up quite a few pens for me to try before deciding on a final one. And we had a great discussion about inks. I would love a part time job there but I fear bankruptcy would be the inevitable result. I’ve read and seen so much about the beautiful Visconti line of fountain pens; and Maureen let me try a Visconti Rembrandt in blue with a medium nib. Beautiful pen and exquisite writing experience. Very smooth, no stops, great flow. But it was a little more than I wanted to spend, even though this particular line is the entrance point for the brand. 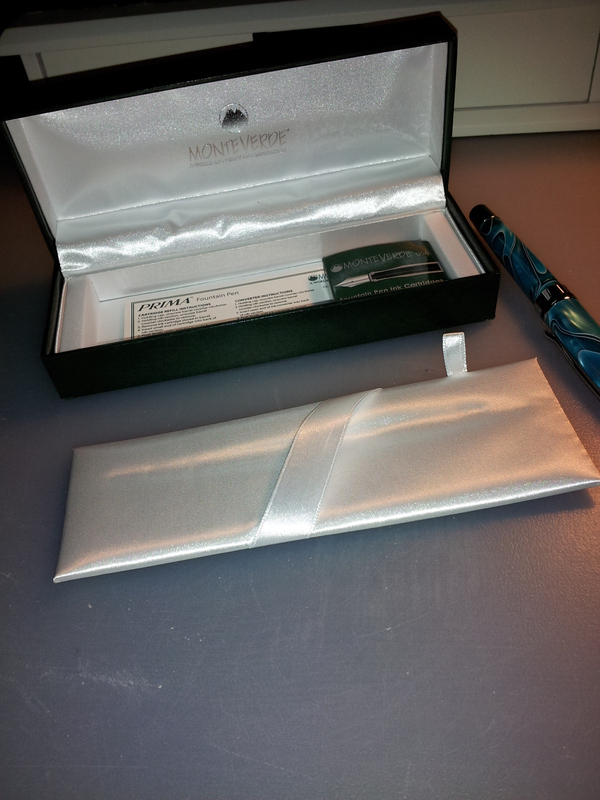 The Visconti I fell in love with, the limited edition pen created for the Queen’s Diamond Jubilee, was definitely more than I would ever be able to spend on a pen. But what a beautiful pen it is. Even better when you are holding it in your hand. I didn’t have it inked up for me as I didn’t want my heart broken entirely. 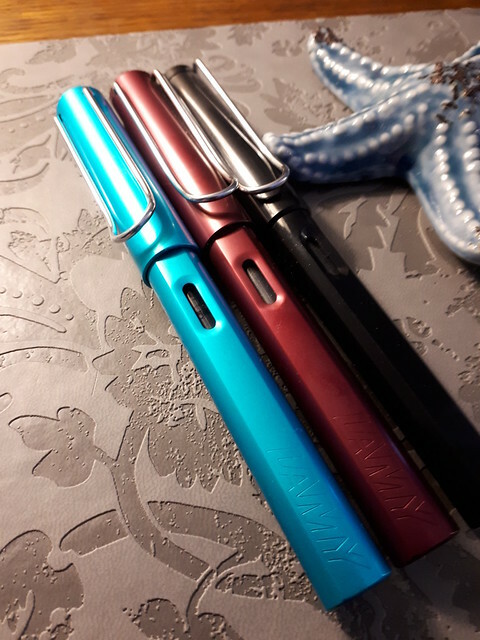 I wanted to introduce some colour to my fountain pen collection, but not use up my entire gift certificate as I wanted to buy some ink as well. 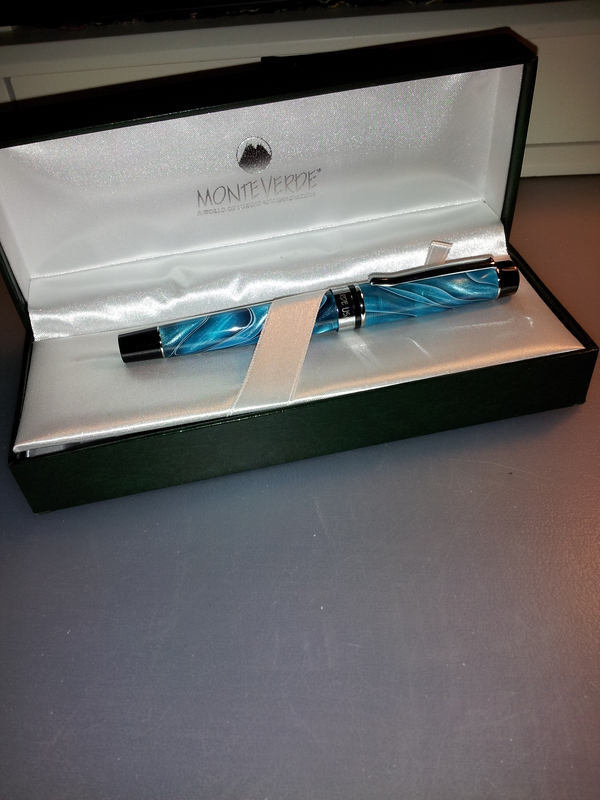 So Maureen introduced me to the MonteVerde Prima. And I fell in love with the Turquoise Swirl. Nice chrome touches, lightweight, super smooth writer with great flow. 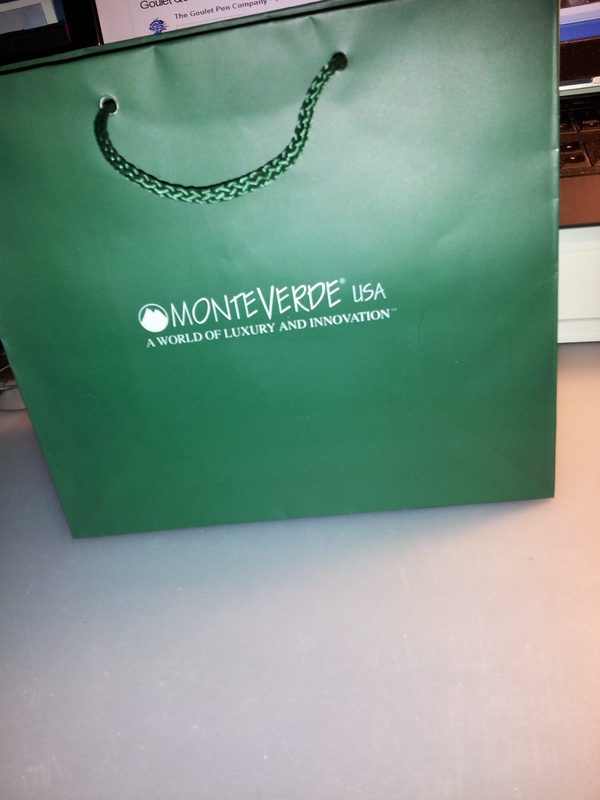 I felt very swank walking out of the store with this bag! It’s hard to tell from the pictures but the pen is translucent so when you hold it up to the light it glows. 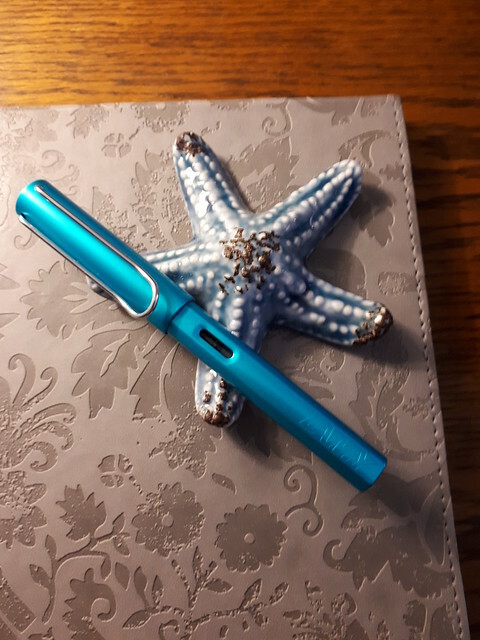 I’m totally in love with this pen; I think it’s beautiful, writes like a dream and retails in Canada for around $60. I do realize that is still quite a bit to spend on a pen but as it was a gift I indulged myself. The Visconti Rembrandt cost almost 3 times as much. 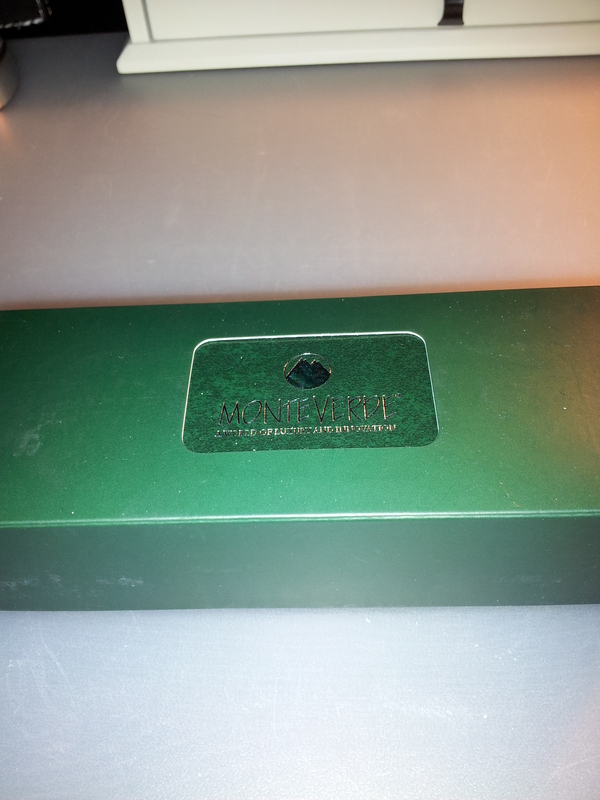 The MonteVerde pens come with cartridges and a converter; the Viscontis do not come with any cartridges and you can purchase a converter for about $10. Both pens take standard international cartridges. The base of the box can be removed to reveal a compartment for storing cartridges and the converter (when I took the picture the converter was still in the pen). 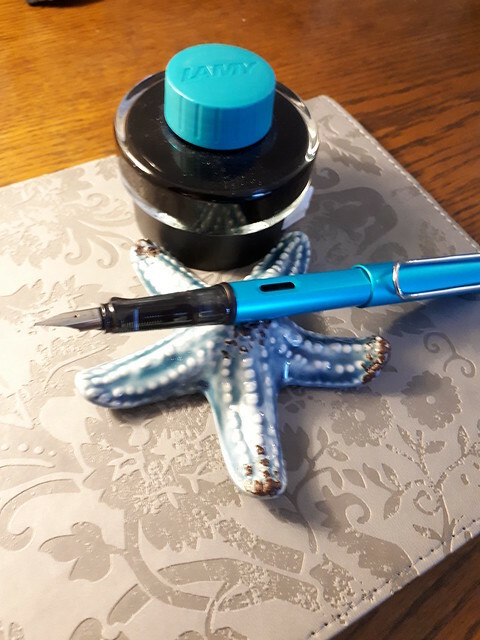 I did not use the cartridges that came with the pen; I put in a Bleu Pervenche cartridge from J. Herbin as the turquoise colour is an exact match to the barrel. 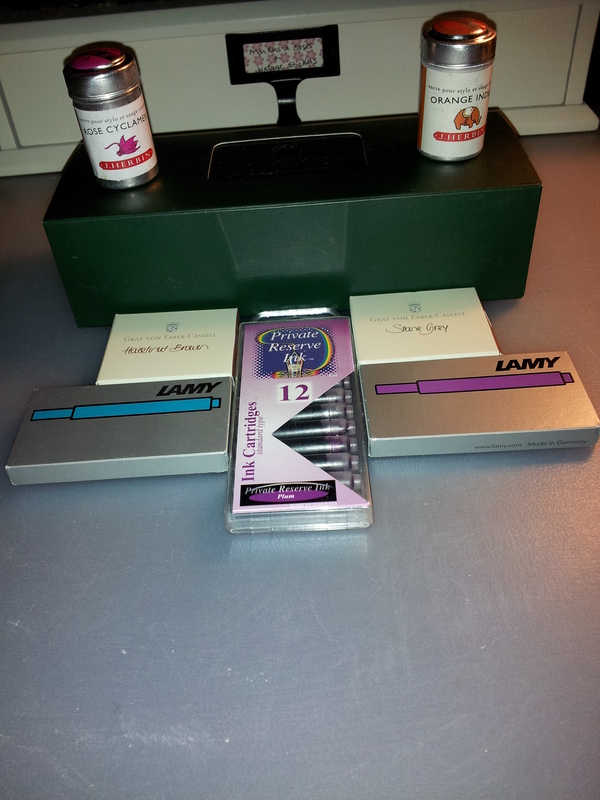 All of my goodies: Rose Cyclamen and Orange Indien J. Herbin cartridges sitting on the MonteVerde box; Hazelnut Brown and Stone Grey cartridges from Graf von Faber-Castell in the cream boxes; Violet and Turquoise cartridges from Lamy; and Plum cartridges from Private Reserve. Wonderful day and I didn’t feel one bit guilty because I was spending someone else’s money. And I still have a balance on the gift certificate!! I will be sure to keep you posted as to where that goes, in the new year. What Type of Pen Aficionado Are You? I think I’m a little bit scribbler, and a whole lot of researcher. That was my conclusion from reading What Type of Pen Aficionado Are You? on JetPens.com. I do own a number of Staedtler Triplus Fineliner Marker Pens, but I do not care for ballpoint pens at all. And my fave pens are not mentioned (the Lamy Safari’s or the Sharpie Pens, currently). Goulet Pens is having a contest: the Lamy Studio Royal Red Giveaway! They are giving away a total of 10 prizes to 10 people so click above and enter now! Contest closes on Oct 28 at midnight eastern. One of their questions you must answer to enter is “What is your dream fountain pen?” My dream fountain pen is the Montblanc Agatha Christie edition. 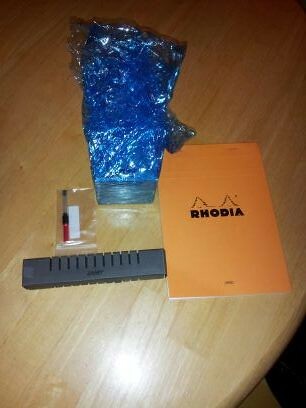 Read an excellent review of it here at thefountainpens.com. But then I read another’s comment about their dream pen: the Krone Shakespeare Pen. I had to check that out at penporium.com. I’m in love. Completely out of my price range but a girl can dream. 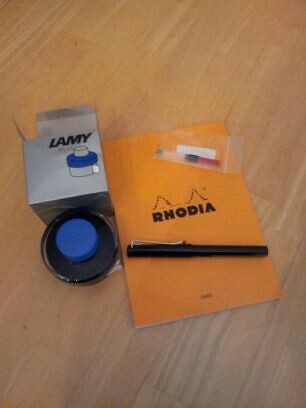 The Lamy Starter Kit arrived on Monday. I wasn’t expecting it so soon – only 10 days to arrive. And no customs charge yay! The charcoal box contains the pen. The red converter is in the small bag. 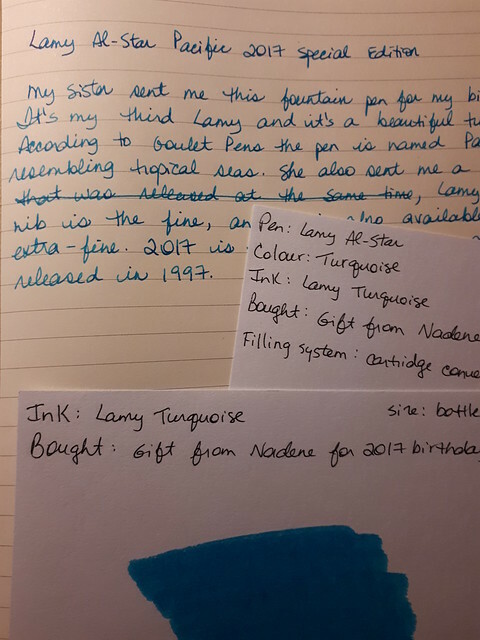 The bottle of Lamy ink is in the blue cling-film bundle. (Actually everything was wrapped in this bright blue film but I tore it off in my excitement, only realizing later that a picture would have been nice.) 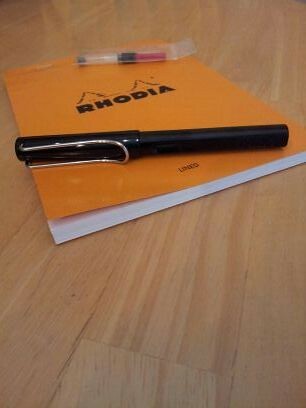 And of course the orange Rhodia notebook. A close-up of the pen; or at least as close as my limited photographic skills and equipment will allow me. The ink bottle is designed beautifully I think. The pen has a good weight and feel in the hand; the fingers slip naturally into the two grooves on either side. It really is fun to write with. 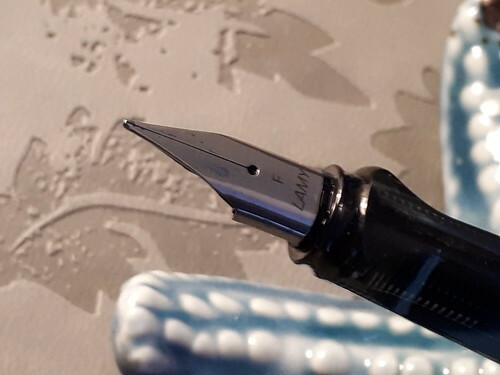 The white area on the ink bottle is actually a spool of tissue, for cleaning the nib while refilling. So clever! I’m new to all of this of course so maybe every ink bottle has this feature. Either way it’s a smart idea. 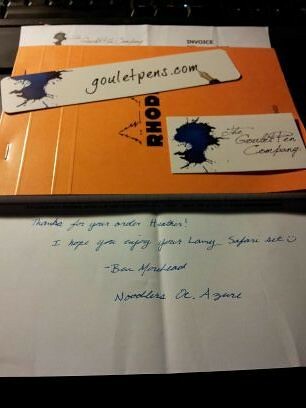 Goulet Pens thoughtfully included a bookmark and a sticker in the box, along with a hand-written note on the invoice. Such a personal touch, which I’m leaning is standard practice with this amazing company. And of course it was great for the note writer to indicate what kind of ink he used. 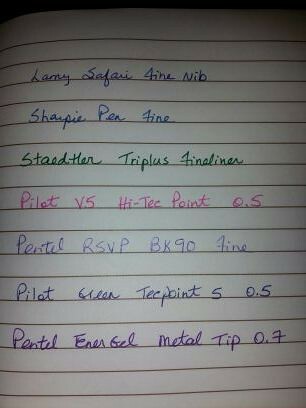 And finally a quick comparison with other pens that I use on a regular basis in my writing. The Lamy wrote smoothly with no skips right out of the box. I’m still using the cartridge it came with. 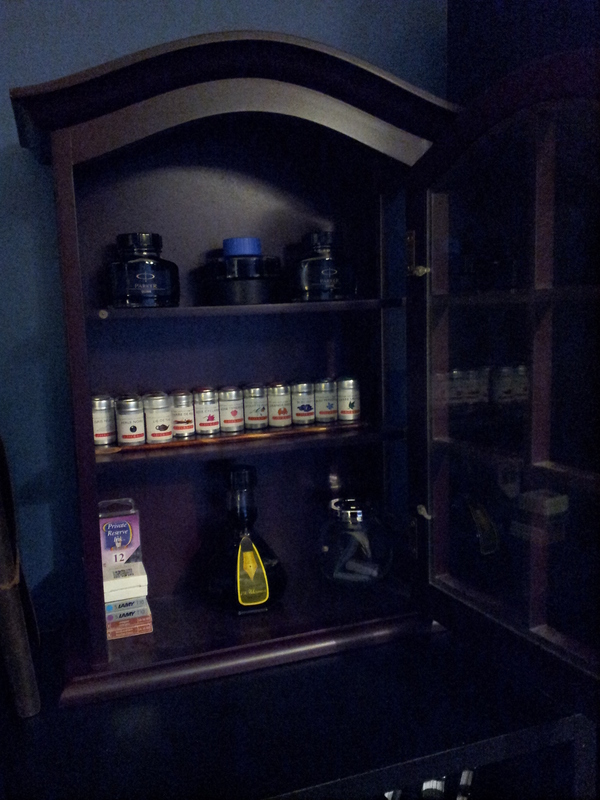 When I want to switch to the bottled ink there is (of course!) an instructional video on the Goulet Pens website to show me how to do it. I like different colors so I anticipate more ink buying, and probably another Lamy down the road, so I’m not switching cartridges/ink all the time. And of course there are other nib sizes to investigate. I initially chose the Extra Fine Nib but then changed my order to Fine Nib after comparing the thicknesses online at Goulet Pens’ Nib Nook. I would recommend a Lamy Safari with no hesitation whatsoever. 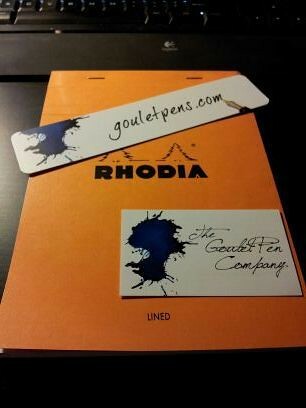 And as you can tell I can’t say enough about Goulet Pens – check them out! I really enjoyed this article by David Garrett on his blog Seize the Dave. I am still a beginner when it comes to fountain pens; I have a Pilot Vpen with a medium nib which I enjoy and it is definitely a budget friendly option. But it’s not as satisfying as I believe a better made (and more expensive) pen would be. I had no idea what to invest in until this article. 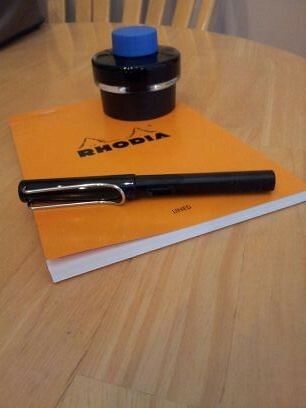 Now I think I will purchase the Black Package from Goulet Pens. I’ve heard so much about Lamy pens that I feel I really want to start there. And they are not too expensive so they are a good place to start. Also the bonus journal is such a nice touch! Enjoy the article! …We do all of this for you, because we are totally and helplessly obsessed with writing and want to share the passion. Feel free to email anytime to give us advice and feedback about how we can enhance your writing experience.